Firstly, I want to talk about my current save which I play almost daily. I have a network save with a friend. At the beginning of this years edition we decided to create our own clubs and start them in the lowest division in England and try to work our way to the top. We are currently six seasons in and still have that real joy for the game – it’s quite fascinating actually. I believe what keeps us interested apart from the yearly head to head battles is the fact we feel attached to our club, it’s essentially ours and we’ve worked on building the club up from the bottom and leading them to the Premier League. Oh, how can I forget the crazy regens that are generated over the seasons. But, enough of me, it’s time to go in to a little bit of detail about different methods and ways you can find that spark with your save. Pretty obvious, right? Well I know a lot of people who play and just sort of have a save and then once they get fed up, they leave and create a new save. To me, I avoid that at every opportunity and even if I leave a club, I always look to find another venture in management. Challenges can be anything you want it to be. It doesn’t have to be long term, and expanding a career over 20 years. It could be a simple challenge like win a title in a certain amount of countries, or create your own player and build him from the ground up. Anything you like, you can do, it just adds that extra bit of incentive to play the game rather than playing with little to no purpose. This doesn’t mean sit and play for eight hours straight, but simply playing consistently. The more often you play the more likely you are to become invested in to the save, rather than playing an hour then coming back to it a week later and not really having a clue what is going on in your save. I understand that not everyone has an insane amount of free time, but allocating time to play regularly to keep the enjoyment level is something that should be done. Adding fictional elements or bringing your save to life could be a way you remain interested in your save. For example, play your game and then look at it from the fans perspective, is a player under performing? Would the fans want this player dropped? More than likely yes. Would they like to see that amazing 18 year old wonderkid get a chance in the first team? Again, the answer is yes. Look at the game from different perspectives and create scenarios in which you can build upon. I always try to keep my saves with a little bit of a story, and many other players do. Often after each year, players will use their best player from the previous save/edition as their manager and then continue the story on. Little things like this could go a long way in terms of enjoying the game and adding various elements. Think of it more of a side quest if you were playing a Role playing game. This is something I don’t do enough of, but that’s due to lack of free time. Many players go to the biggest club in the world with the best squad and simply play, which is fine. However, you could create different challenges within the save to increase the saves difficulty or time. Alternatively, you can start a career with a manager with absolutely no experience and badges and start your way from the bottom of the footballing ladder and try to work your way up. Even trying a different country that you haven’t managed in. I bet a lot of you haven’t managed in Chile before? Try something new, put yourself in the deep end. We all love them, so lets use them. Databases can range from anything to player adjustments, created players, playable leagues. It’s essentially expanding on the vanilla and offering players an opportunity to alter their game. This could really be a database which really grabs you in. Think of all the world class players who were around then, Ronaldinho, Kaka, Nesta, Dida and so many more. Even try picking up a young and talented Lionel Messi, but I don’t think he’ll ever live up to the hype, right? Here is another example of a database that has been created. This completely new nation has been created from scratch by the wonderfully talented Laura. I believe this really combines the vast majority of previously mentioned points. There’s always that one shining star within your club ranks, why not focus on him? Combine the above mentioned pointers, like adding a narrative to the player and try and make his career blossom. 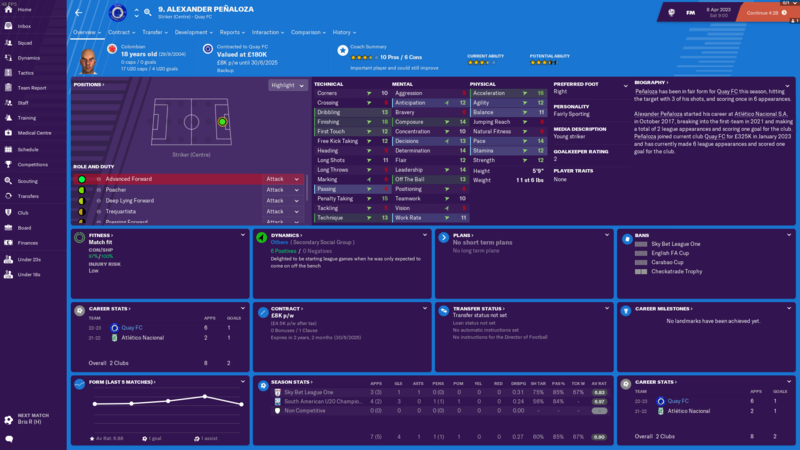 Creating a ‘Golden Generation’ is always really something that is on the minds of Football Manager players and you can create your own. Not with a youth intake, but recruiting players that you believe will influence your golden generation. An Example of a regen from my save. This was one of my wonder kids who I have found and used within my personal save. He is one of the many players I have a ‘special’ connection with and hopefully you can replicate that within your own save. I hope you enjoyed this article, and find these tips beneficial to keep the spark with your save. If you do, or have any other ways you keep the spark with your save let us know on our social media platforms or simply commenting below.